Hi! Today I'm back with another review for Born Pretty Store. 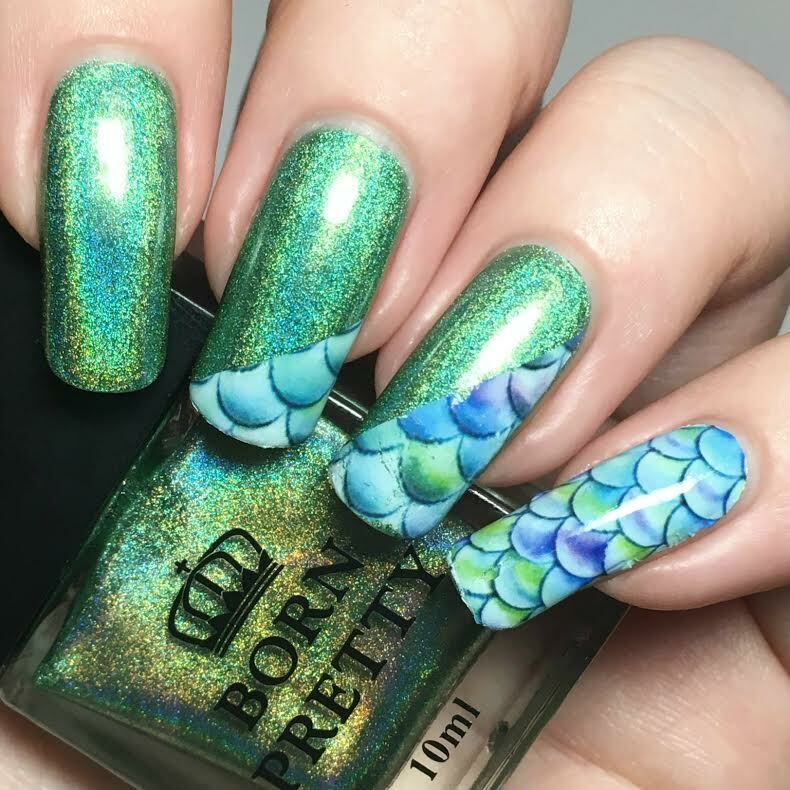 This time I have a polish and a set of mermaid scale water decals to share. The polish is from Born Pretty's holographic range, which I believe is new (or I have managed to miss them until now!). I decided on the green shade, as I thought it would pair well with the decals, as shown below. Read on to find out more! 'All Embracing' (item #35876, online here) is a soft yet bright green holographic. The formula is amazing. It is so smooth and easy to apply, and is opaque in just one coat. I added a second out of curiosity and while it deepens the colour slightly, it's so holographic that it's hard to see a difference. Below is two coats and topcoat. As mentioned previously, I thought the green shade would pair perfectly with the mermaid scale water decals I recieved (item #31133, online here). Here's a quick look at the full sheet before I tried them. Incase you aren't sure how to apply water decals, there are instructions on the back of the sheet - cut out your desired pattern, soak in warm water for 10-20 seconds, place onto the nail, and pat dry before topcoating. I did exactly this to create the look below, with varying size pieces of the decals. What do you think? I really love the combination of the two - it looks like my inner mermaid is escaping! I love the polish so much that I need all of the other colours. I was also impressed with the water decals. They are thin enough to gently shape to my nail and move around, while being strong enough not to tear or crumble. I can happily recommend both products! 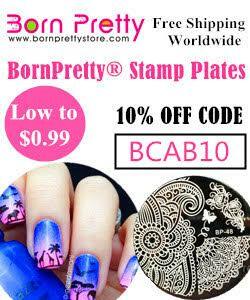 You can find Born Pretty's online store here. This is the perfect way of using these decals! Stunning, the colours are perfect and the way you customised the decals works so fantastically. Perfect way to showcase polish and decal. Wow - these compliment each other so well! :) Love holos! I don't think I realized that Born Pretty had such beautiful polishes. What a clever way to use those decals! Love it! Its safe to say I love this mani, the use of the decals is just perfect! This is incredible! You've applied the decals perfectly. 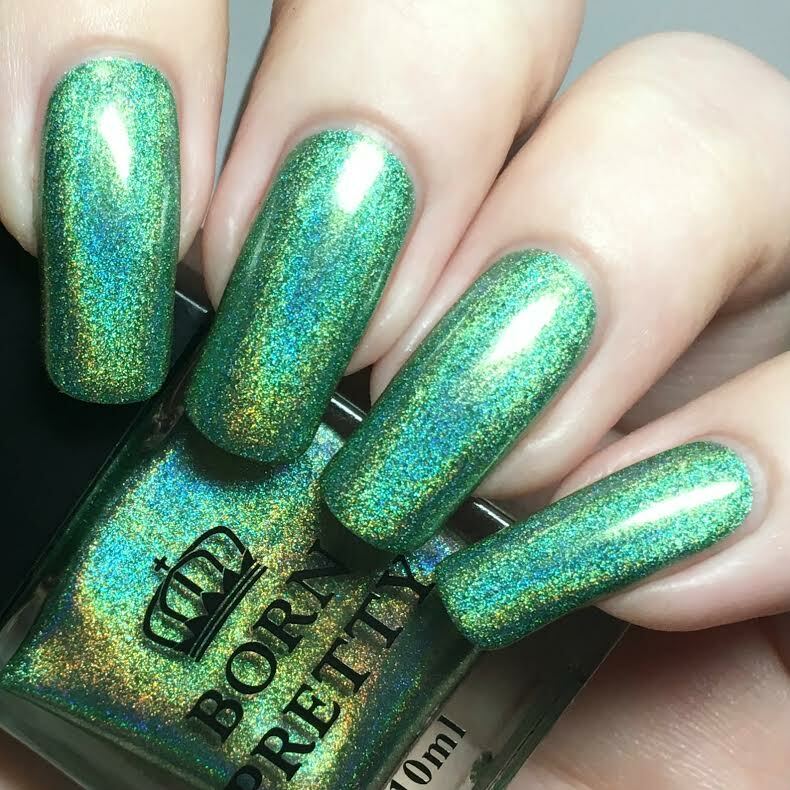 Did you get any staining with the green holo polish? So Gorgeous mani.. <3 Just WOW!! I'm not a decal fan, but you made me fall in love with this look!! BPS has been killing it with their holos. I need some!! This is so fabulous. I love how you used the waterslide decals in such an unexpected way! That's something beautiful and I love your creative use of water decals. I LOVE this look!! That green holo is really pretty. I love this! It's like a mermaid superhero slowly shedding her daytime disguise. Very pretty decals! I like this design a lot. I love that you paired the water decals with this polish! Love that polish so much! It's beautiful. I've never tried to apply decals. I need to because I have a few different designs that were sent to me through the years. I love the mermaid theme! I haven't tried decals before but I have some sitting here. They sound super easy and they look amazing on you! I love this manicure! I agree, looks like your inner mermaid is shining through! I have never tried water decals before, but I want to soon! This is just gorgeous and such a unique combo idea! I love it!